Happy Tuesday everyone.. are you ready for Day 2 of the April Release from Newton's Nook? 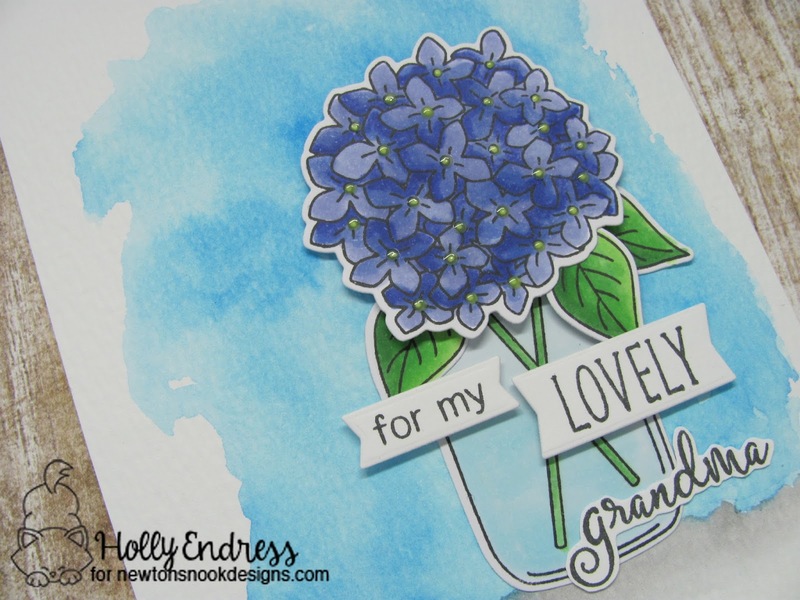 Today we are sharing a look at the new set Lovely Blooms and it's coordinating die set. We all know by now I have an obsession for all things Distress Ink... So I had to create another background for my project. I used some Salty Ocean and Hickory Smoke Distress ink to create the background on a piece of watercolor paper and then I mounted it to a White card base. Then I stamped the images from the Lovely Blooms set onto some White card stock and colored them in with Copic Markers. I used the coordinating dies to cut them out and adhered them to the card front with some liquid glue and foam tape. I wanted the center of the flowers to be a light green color so I added some Gloss - Apple Green Nuvo Drops. While that was drying I worked on the sentiment. I stamped the sentiment onto some White card stock and used a banner die to trim them out I adhered them over the jar image with some foam tape. For the word Grandma, I stamped it and then fussy cut around the image and adhered that directly onto the jar with no dimension. This set is great for anyone who loved flowers or creating arrangements. So pretty! 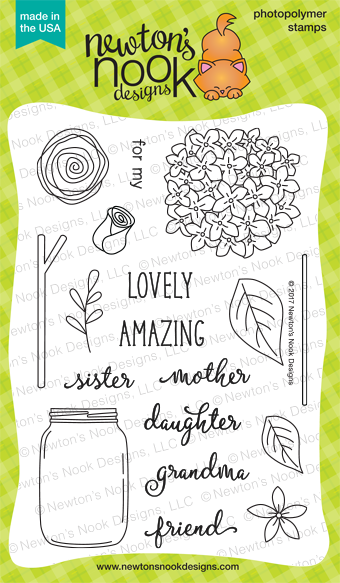 I really love the font on this set and your watercolor background is gorgeous for this flower! Such a sweet card for grandma! This is so pretty! I love the pretty color! Very pretty card! Love the use of nuvo drops for the flowers center. Very pretty card, Holly. Love those distress inks, too. I would of never guessed that you used a smokey color with a blue or the background watercolor! The nuvo drops was a good way to make this card really draws your eye in. Thank you!!! Oh this is so beautiful, Holly! I love the soft watercolor, and your simple design really showcases the beauty of this stamp set! Such a beautiful card! I love the soft colors and the fun details with the words popped up on little banners! Thanks for the wonderful inspiration! Love!! This flowers they look like hydrangeas and my favorite color!! Gorgeous Holly!! So pretty! Love that gorgeous hydrangea flower and the pretty sentiment! Hydrangeas make me think of my grandmother too, as she had them in her yard! Beautiful card! 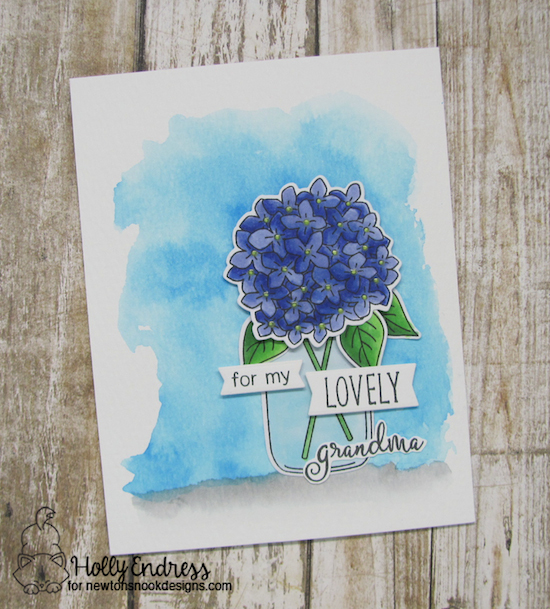 Love how that gorgeous hydrangea pops off the watercolored background! Lovely card. I like the soft background. Your card is lovely. I love the beautiful simplicity of it. The background is a perfect compliment to the jar of flowers. This is absolutely adorable! Every element is placed perfectly and the colors are just fantastic! wow---your card is absolutely beautiful---so soft! Such a beautiful card and stamp. Love the coloring. Lovely card and coloring! This is such a sweet stamp set. I LOVE your card!! It's beautiful!!! I love the watercolour background. Your card is beautiful. Love the background!! So pretty!! i love these flowers...that is my fav. colour on the hydrangea. Gorgeous! I love the blues! Cute card. I'm really loving these flowers.